Happy love week! Valentine's Day is hands down my favorite holiday. I start getting excited for it before Christmas, and the excitement builds to epic levels in February. I'm not sure exactly why it's my favorite… I never have any expectations from my husband for Valentine's Day. Usually we make dinner together after the kids are in bed and try to make it through a romantic movie without falling asleep. :) I think I just love the chance to show my husband and kids how much I love them. And I'm crazy about anything pink or red, so there's that too. Our family has a tradition of having a special breakfast together on Valentine's Day. I put little presents on everyone's plates and make something delicious to eat, and generally decorate the table with as many obnoxious Valentine's decorations as I can. 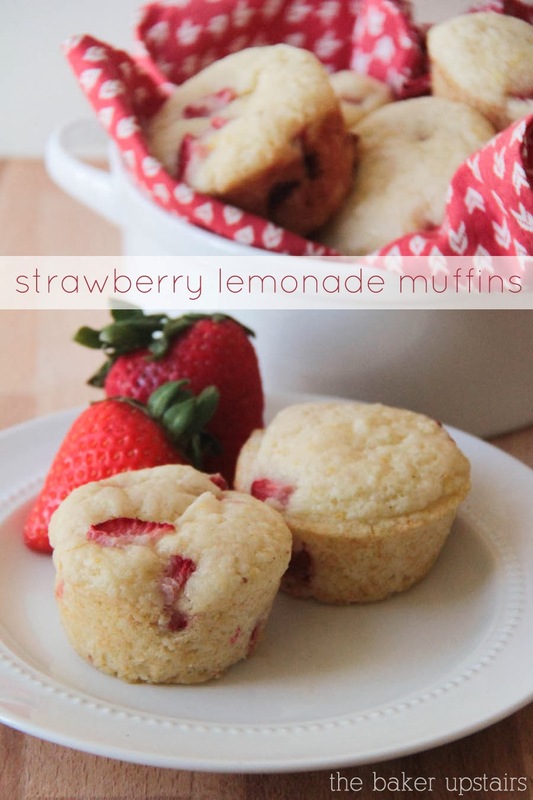 I think these strawberry lemonade muffins would be perfect for a Valentine's breakfast! They're bursting with juicy strawberries, and the hint of lemon makes them extra special and delicious. Share them with someone you love! Preheat oven to 400. Line 12 muffin cups with paper liners. In a large bowl, whisk together flour, sugar, salt, baking powder, and lemon zest. In a measuring cup or a small bowl, mix together melted butter, egg, milk, and lemon extract. Add to dry ingredients and mix until just combined. Gently fold in strawberries. Scoop into muffin cups, filling 2/3 full. Bake 15-20 minutes or until a toothpick inserted in the center comes out clean.